2draw.net - boards - Intermediate - For Wrent? well...this is what I see when I look out our back window.. Its embellished a bit..but essentially this is the view... I am glad it translated in the pic.. This is awesome, I like the realism in the fence. I love it! It looks like it was painted on canvas! Another job well done, Da Vinci! You even included the little bird. 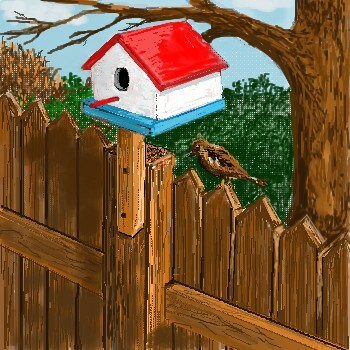 ^-^ The fence is so realistic, and the bird house just pops out at you. It's hard to see the bird though. Maybe making it lighter would've made it also pop out, but it's still wonderful. Wow, when did this happen? Talk about painterly looking. WOWEE. oh man, thats so real looking. i love it. and awesome use of texture...awesome work.